LifeStraw has a 0.2 micron filter. Since "most bacteria are 0.2 µm in diameter and 2-8 µm in length" (source), is it safe to drink water from any source using LifeStraw without boiling? (India in particular) Or should I better use water purification tablets? remove heavy metal contamination (lead, mercury). This is possible with ion exchangers, distillation and nanofilters (see below). remove viruses. Most of them are too small and will easily pass through the filter. remove substances like salt and magnesium which make the water undrinkable. It is possible with the same principle and is then called reverse osmosis, but it needs filter sizes about 1 nm. Also possible is the use of ion exchangers. remove pollution with big particles. For that reason the filter does not work alone, but needs prefilters like charcoal which prepares the water for the microfiltration. Such units used by survivalists and the military have several components to make water drinkable. This does not mean that the product is not working or is unsafe, it simply means that you cannot trust any source. Boiling is not able to remove heavy metals (in contrast, it increases the concentration) and some pathogens, but for the "normal" usage it is sufficient. Inform yourself about the problems you may face in your destination country (In India it is mainly giardiasis). The normal and quite cheap way in India and in other countries for getting water is always use packaged, unopened(!) bottled water. I for myself prefer Micropur (silver ions) for water preparation. It needs electricity to pump water through a very fine membrane (and another, rougher one). 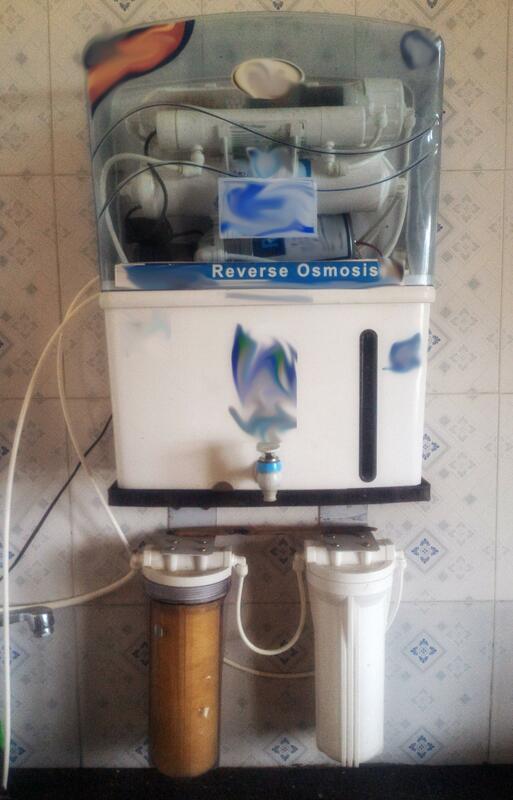 This process is known as reverse osmosis. It's the same technology that's used to create the vast majority of bottled water in India. It needs an electric pump because the holes in the membrane are so tiny that even viruses can't get through. This makes pumping harder, and also means that there's a significant amount of wastewater that doesn't make it through the membrane, but goes back out into the ground instead. It has an additional ultra-violet filter which kills any number of microorganisms that might have made it through the membrane somehow. This is for absolute redundancy. I paid 13.000 INR for that machine, while the LifeStraw sells for 1100 INR on Indian Amazon. Needless to say, much of this can not be accomplished by the LifeStraw. Many parts of India have severe problems with industrial waste draining into the ground water. In the area where I live, there's no sewage or drainage system. Much of the household sewage and wastewater (as well as industrial and agricultural waste) goes directly into the ground. That includes detergents, chemicals, pesticides, feaces, etc. from factories, farms and households. In some areas, water comes from lakes and rivers, and these are often polluted and contaminated as well. I use RO water for cooking too. So does any halfway decent restaurant. Such restaurants and households have their own RO machines. For short trips I certainly recommend bottled water. Thorsten has an excellent response re: the filtration failings of the lifestraw itself. I would find sucking on the lifestraw for all drinking water tiring. When I visited rural China, I used a tiny, battery-operated UV based sterilization system. It would sterilize 500ml of water at a time, plenty for everyday use. I also used the water to wash my own utensils as I didn't always trust the utensils provided at rural restaurants. I even "nuked" the bottled water when I didn't trust that the bottle hadn't been refilled. One thing to consider, for example: how are you going to rinse your mouth after you brush your teeth if you only had a lifestraw. Many tourists have unthinkingly used faucet water by mistake! There's also the problem that water is not the only source of contamination. You need to be very careful about the type of food you eat and how it was prepared, stored, and served to you. Note that UV and chlorine/iodine systems don't remove chemical contaminants. Many people use an activated carbon filter in conjunction. Still, a carbon filter and UV sterilizer can fit in a large nalgene water bottle and operate on batteries without ac power, which is more can be said for reverse osmosis systems. Not the answer you're looking for? Browse other questions tagged india health gear tap-water or ask your own question.